Two no-confidence motions brought against Rajapaksa were passed by the Sri Lankan Parliament on 14 and 16 November 2018. Both were rejected by President Sirisena stating that proper procedures were not followed. 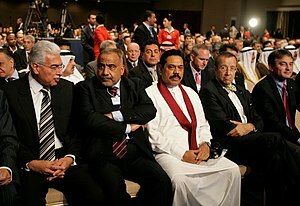 On 3 December 2018, a court suspended Rajapaksa's powers as Prime Minister and ruled that his cabinet could not function until its legitimacy was established. Rajapakse resigned as Prime Minister on 15 December 2018, with Ranil Wickremesinghe re-appointed as Prime Minister, and Rajapaksa appointed Leader of the Opposition.